Stone Therapy, according to Nirmala, works like medicine to reduce and neutralise the negativity in life. "The universe is made up of positive and negative energy. 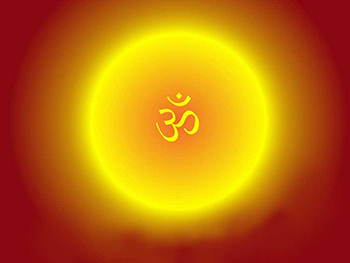 So, with the help of Mantra and Yantra you can increase the positive forces and decrease the negative ones. If a person is destined to tie the knot at the age of 42 years, you can bring forward the marriage to 24 with gem/stone power. Likewise, the effect of a serious accident in the offing can be nullified." . a person is destined to tie the knot at the age of 42 years, you can bring forward the marriage to 24 with gem/stone power. Likewise, the effect of a serious accident in the offing can be nullified.". Nirmala is a renowned stone therapist and can help you Mould your destiny through precious stones. In this beautiful and mysterious creation of the nature, humans are the only living beings who have attained the highest pinnacle of glory in this sentient world world by virtue of their intellectual faculty and a never ending urge for logical investigations. 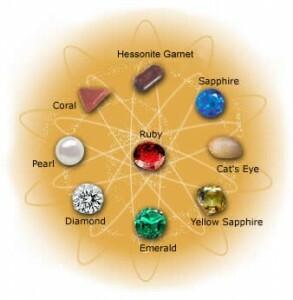 It is believed that the origin of the nine basic gems – Ruby, Emerald, Blue Sapphire, Pukhraaj, Pearl, Coral, Gomed, and Cat’s Eye is due to the effect of rays directly falling into the sphere of influence of the Sun, Mercury, Jupiter, Moon, Mars and the imaginary points Rahu & Ketu, respectively, according to the specific elements contained in them. This explains why the colour of gem varies according to the colour of the planet governing it. The gem stones produced in the womb of mother earth possess great utility of moulding human destiny to some extent. This fact is fully borne out by scientific investigations conducted for both the elements of fire (Agni) and water (Soma) referred to the above in connection with the formation of the earth planet, are in the essence of life and the spine of the gems world. The elements of water and light are of utmost significance in the case of precious stone as well and their value is determined by the quantity of each contained in them.